Galbraith was featured in Fine Art Connoisseur magazine’s editorial titled “Today’s Masters: The Enduring Appeal of Youth“, authored by Max Gilles and featuring portraits of children. Her painting “Addie” was chosen as one of the images represented in the article. In addition, Fine Art Today’s lead article, written by Andrew Webster, featured her week spent at the National Gallery of Art in Washington D.C. The article appeared October 26, 2016. The event Galbraith attended was a tantalizing program for artists that allow them the opportunity to sketch and paint directly from the gallery walls. 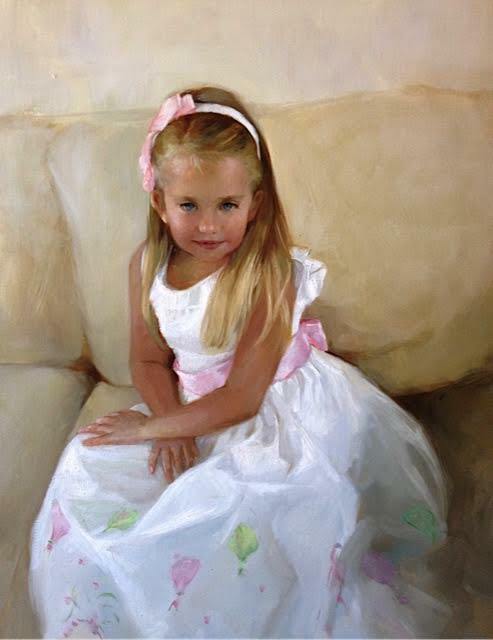 Galbraith is a nationally recognized artist who has received numerous awards and recognition throughout her career, including First Place, Portrait Society of America Members Only Competition. She has exhibited throughout the United States, in galleries from New York to California. Her success as a portrait artist is evident as her clients return repeatedly to have Galbraith paint members of their families. Notable clients include President George H. W. Bush, leaders of society, heads of corporations, religious institutions, hotels, writers, athletes, and presidents of colleges and other academic institutions. It is truly a pleasure representing such talented and successful artists such as Katherine Galbraith. Enjoy the Fine Art Connoisseur article at http://fineartconnoisseur.com/2016/10/an-opportunity-artists-should-take/ and please contact us if you’re interested in discussing commissioning a Galbraith portrait for your family or organization.